Why is this retained water critical? The most immediate problem occurs when the weather is warm and your family is spending the most time out of doors. The retained water is stagnant. It’s a warm and cozy breeding ground. When you’re on your upper deck, there’s a mosquito farm just under your feet. Later on, leaf litter and other debris will find its way to the draining surface of the waterproof ceiling and sit in the pooled water. The litter sits, becomes waterlogged and sinks. It’s now harder for the next rain shower to rinse away. As this repeats the litter will accumulate, creating a dam. When the water level rises enough, the ceiling will begin to leak between the panels . Leaks are not the worst problem caused by retained water. The litter accumulation will get heavier and heavier. Eventually, after some years perhaps, one or more panels, or a gutter will collapse. The repair in some cases can be as labor intensive as the original installation. A system that does not retain water allows litter to dry out between showers so it can float and be washed away in the next rain. Do I need 5 inch or 6 inch gutters? 90% of our gutter installations are 6 inch rain gutters. 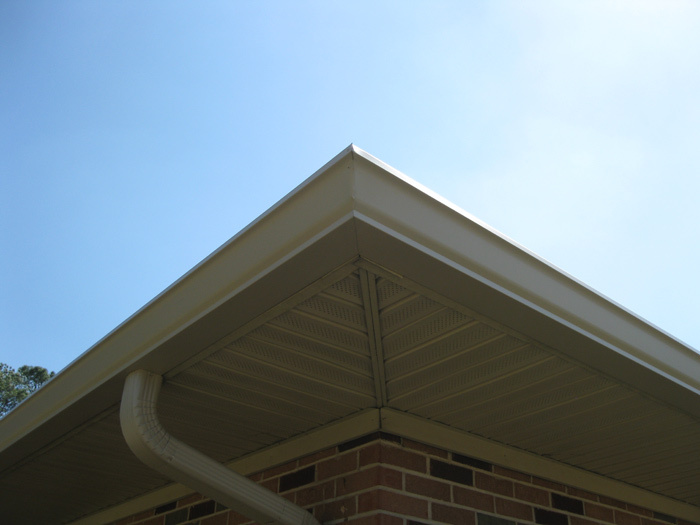 Most homes today are large enough that the 6 inch rain gutter is a better option. 6 inch gutters handle more water and flush debris out better. Additionally 6 inch gutters often look better because they can be installed evenly with the bottom of fascia boards. We most often install 5 inch gutters when replacing or repairing just a portion of the gutter system to match existing gutters or in homes with a smaller roof area when the homeowner prefers 5 inch. This depends on the size of the roof area & how much water the gutter is handling, but a rule of thumb is no more than 30 ft to a downspout with a 5” gutter, & no more than 40 ft to a downspout with a 6” gutter. We recommend a downspout on each end of the run of gutter if the gutter is longer than this or if your roof area is larger than normal. How big should my downspouts be? This depends on your roof and spacing of your downspouts but we normally install a 3”x4” rectangular downspout. Placement of the downspouts is almost more important than size but we do not recommend anything smaller than the 3”x4”. The 3″x4″ downspout carries twice the water capacity of a 2″x3″ that we commonly replace and is normally the best solution for most residential homes. We also offer a 4” round downspout. This is becoming more & more popular because it looks more decorative & traditional. For some commercial applications a 4”x5” downspout may be necessary. What is a custom miter? Most gutter systems around have the troublesome ‘box miters’ on every corner. These ‘box miters’ are a pre-made piece that anyone can pick up at the hardware & install on any gutter. The problem that we have with this is that normally they do not fit very well because every gutter machine makes a gutter just a little differently. These box miters are normally made out of very thin aluminum & are easily bent out of shape. The other problem we have with the box miter is the seam issue. A box miter always wraps around the corner, so you end up with 3 seams to seal & keep from leaking. The potential for leaking problems is much higher simply because there are more seams and joints. The correct way to make a corner is to use what we call a custom miter. This is when the gutter material itself is marked, cut to fit & fastened together. This corner is much stronger, looks much better, & has less potential to cause problems as the gutter ages or during heavy use.